In all your crazy maintenance the past 24 hours, you lost my recipe. This delicious dinner, all my funny words, gone. I hope you find it in web-land, but if not, I will just have to leave my readers to wonder what I said that was so funny. Because I’m not able to remember. It was one of those, “you just had to be there” moments. Anyways, Please make this tonight. Or tomorrow since it’s too late for a crock-pot recipe now. Unless of course you read this at 6am tomorrow. Whatever. If you like Chipotle, this is my version of their Barbacoa and Cilantro-Lime Rice. Enjoy! 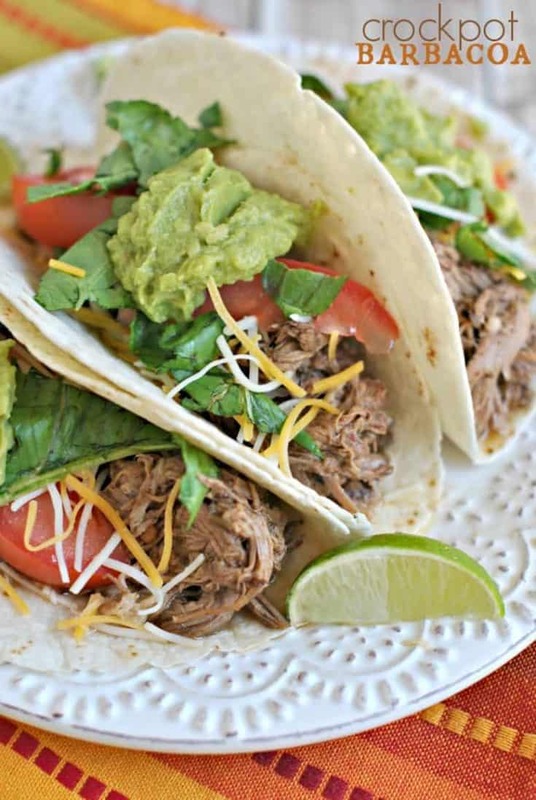 For the barbacoa: In food processor (or blender), combine vinegar, lime juice, chipotle peppers, garlic cloves, cumin, oregano, pepper, salt and ground cloves. Process on high until smooth. In large crockpot, add roast, pepper puree, bay leaves, and chicken broth. Heat on low 6-8 hours. Shred beef and place back in juice, remove bay leaves. Serve on a tortilla with cilanto-lime rice, colby cheese, lettuce and guacamole. Enjoy!!! For the cilantro lime rice: Combine rice, water, butter and salt in large saucepan. Bring to a boil over medium heat. Reduce to low and simmer for 20 minutes. When done, add lime juice and cilantro. Yum. I don’t eat fast food either, but I do like Chipotle (though I rarely go there, either). These recipes look great! Thank you thank you thank you for posting this!! My husband and I love mexican food, especially Chipotle and Qdoba and we’ve been trying to master their rice and could never get it. As I was reading your post I was hoping that you would have a recipe for rice…and you do!! Thanks again! P.S. you wouldn’t happen to know of any good corn salsa recipes like they serve at Chipotle? OMG that looks yummy!! Oh and I will take whatever is in that glass too!! Yum! haha Liz- just a little Seagram’s wine cooler, or energy drinks as I like to refer to them!! What an awesome Crock Pot surprise. We would just love this recipe. Thank you so much for sharing with Full Plate Thursday and hope to see you next week! Yummy! i’m going to make this on Sunday! new follower from mangoes and chutney link party. @ Pretty- I too love using the crockpot. Especially on evenings when life is totally crazy with sports, or I’m busy in the garden! @ Laura- thanks for following, I love Miranda over at Mangoes and Chutney! Thanks for the comment love Aimee! This cilantro rice sounds amazing and I am definitely going to work it in my menu the next time I get some cilantro. Sorry about the Blogger fiasco, I was a little bent out of shape that day too! Thanks for linking up to Fat Camp Friday this week! See you next Friday! I love barbacoa! Thanks for the recipe! Cilantro-lime rice sounds delicious! I’m dying to make it now – will definitely try when I get home this week. Especially since barbacoa sounds amazing! Ugh — so sorry to hear that Blogger lost your recipe and your post, but you still pulled off a winning post and recipe with terrific wit and style! This is definitely a must-try recipe for me this summer. I’m woefully short on good crock-pot recipes, and even shorter on time, so I’m really excited to try your barbacoa recipe! Thank you so much for coming back to “A Little Birdie Told Me…” Tuesday at Rook No. 17 this week! Found your blog via Tasty Kitchen. This recipe is fantastic! My Chipotle-loving husband just told me I knocked it out of the park and I’m going back for seconds before it’s all gone. Thank you! Rebekah- so glad to hear it!! 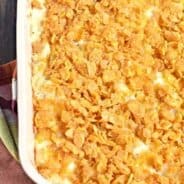 Just stopping by to say thank you so much for linking up to our Family Favorite Recipe Round-Up today! We’d love to include your recipe (and any other you’d like to share) in an upcoming Gooseberry Patch cookbook. When you have a moment, would you mind stopping by our website and sharing it with us there? Here’s a link: http://bit.ly/GBPsharearecipe Add the code RRU-FF to the Special Code field and we’ll keep an eye out for it. 🙂 If it’s selected for publication, we’ll let you know, and you’ll receive a free copy of the cookbook too! Thanks again for sharing on our blog today…we appreciate it! I am in love with Chipotle, and I’m definitely going to have to try this one! Me and My husband are in l o v e with the barbacoa from Chipotle, and my husbands been bugging be for over a year to make it at home. I will def. try this recipe, looks really easy. 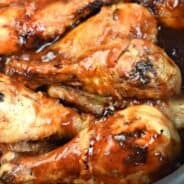 A lot of other recipes Ive found for this calls for TONS of (weird) ingredients. Thank You! This recipe looks wonderful! I’d love it if you submitted it to us here at Gooseberry Patch for possible inclusion in a new slow cooker cookbook. Just follow the link for simple directions! Thanks! I can’t wait to try this recipe! I LOVE Chipotle! I am going to the grocery store now! Thanks for sharing! With the reservoir filled, plug the spray gun into either an electrical outlet or an air compressor. water in the PVC pipe. a set of dumbbells that can be lifted alternately or simultaneously. I was the general manager for Chipotle Mexican Grill and neither one of these recipes are even close! All my new recipes have print options, I’m working on getting these older recipes into the program!! 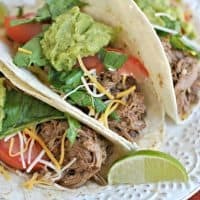 I just found this recipe for crockpot barbacoa and would love to give it to my daughter-in-law since she loves, loves, loves this stuff. 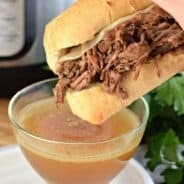 Could you please advise how much apple cider vinegar to use as the recipe says ? cup ! Would love to know how much apple cider vinegar to use ! Thank you ! Hi Jeanne, it’s 1/4 cup. Do you think the meat and sauce could be frozen and then cooked in the slow cooker as a freezer meal. Wow!! 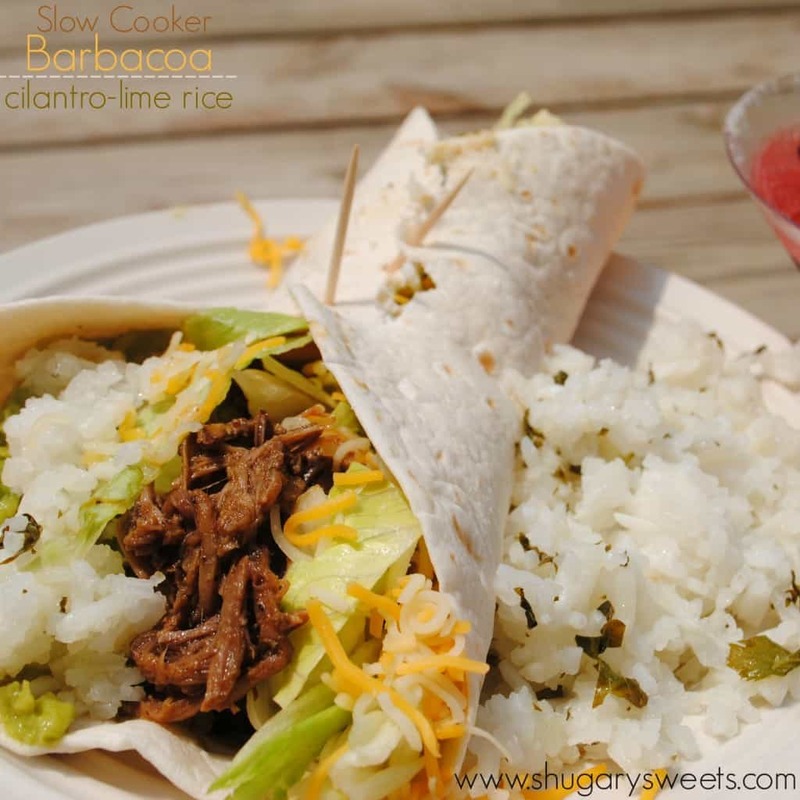 This Crockpot Baracoa and Cilantro-Lime looks so amazing I’m going to make it tmw night for dinner. I come from a Hispanic back round and don’t find many recipes that speak to me like this recipe. Thank you for this idea. Made this for dinner tonight! Do you pour the pepper purée over the meat or just in the bottom of the crock pot? YOu can do either. I usually pour it over the meat. Looks good but this is not barbacoa! 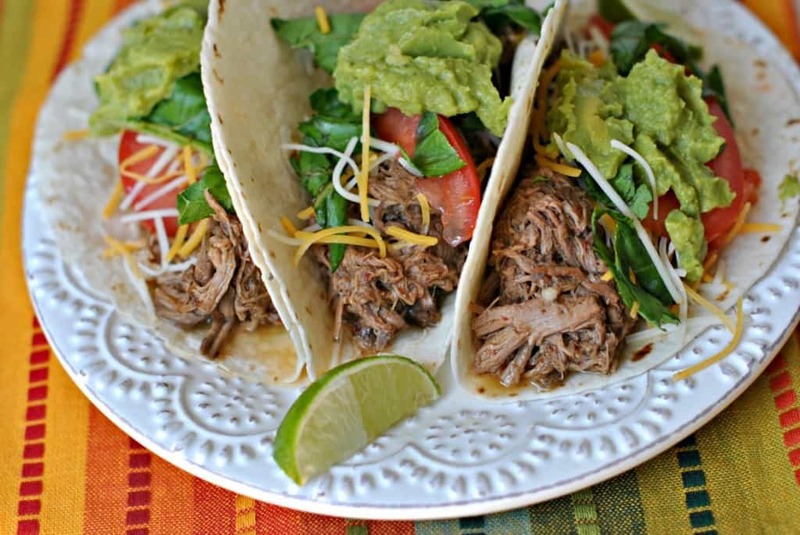 It just meat…barbacoa has to be made in a hole in the ground with cactus! Cant be made in a kitchen, sorry.